What an absolutely adorable set of earrings! Firstly, they are packaged in a very pretty pinky-peach colored gift box, adorned with a bow. The box is then packaged in a clear cellophane package, keeping the pretty box clean and safe. Shipping was fast and arrived within a couple of days of ordering. The earrings themselves are costume jewelry, but are very well made. 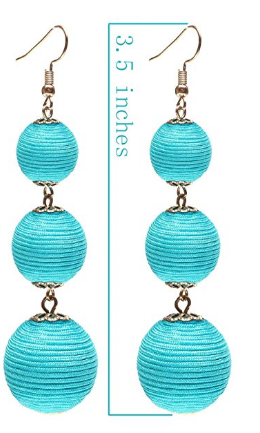 The balls are covered in a turquoise colored shimmery thread and they are graduated in size. The the length is approximately 3 1/2" long. The metal is gold tone alloy with french hooks. I adore how the gold hardware plays off of the turquoise color; very classy. 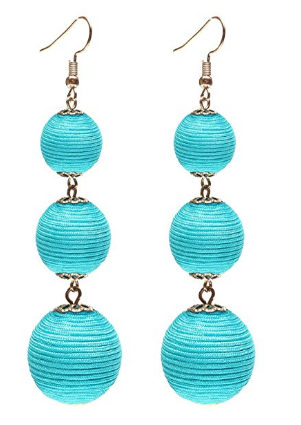 I love how perfect these are for warmer months; what a great look with a pair of simple white leggings, white tank top and sandals; letting these statement earrings be the focal point. These statement earrings are right on trend. As with most costume jewelry, be mindful when applying body lotion or spraying perfume near the earrings. You don't want to discolor or tarnish them.